Old Timer Hunting / Cleaning Knife Kit. Three piece set includes: 8-1/4" overall fixed knife with 3-3/4" drop point blade, 6-1/4" overall fixed knife with 2-1/4" blade, 7-1/4" overall take apart shears with 2-1/2" partially serrated blades and black plastic handles. 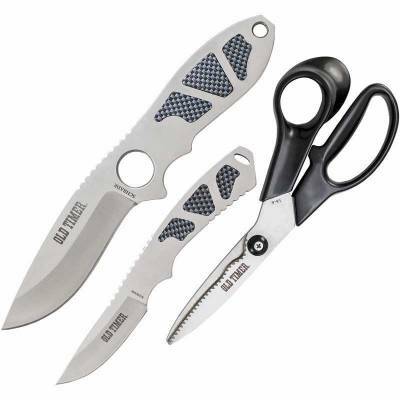 Both knives feature one piece construction with faux carbon fiber synthetic handle inlays. Black nylon belt sheath holds all three.